Here you can play 473 online games from Big Fish. Create the perfect garden! Comb the rooms of a gorgeous mansion for hidden items and restore a once stunning garden to its former glory in Gardenscapes! 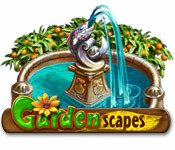 Choose from tons of garden items and accessories to customize the garden to your taste. Become part of the cityâ€™s community and partake in the competitive â€œBest Gardenâ€ contest. Become an outdoor dÃ©cor pro in this cutting-hedge, Hidden Object game! Rating: 4/5 from 1 votes and 1 reviews.